Battle for Kujawy, fight happened on 4 November, 1314 AD. The battlefield before the attack. Battlefield - a special structure that is automatically created in the region, which should happen battle. A battlefield will appear in the attacked region after some time. It will be possible for soldier to travel directly in the battlefield. While in the battlefield, characters won't be able to access region structures and will be protected from arrest or restrain actions. It will be possible to leave the battlefield either by accessing the region or by traveling to another region. 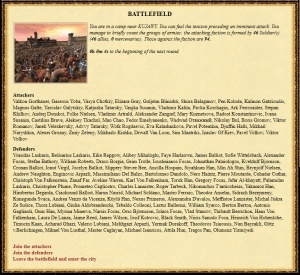 While in the battlefield, a character can choose the side for which he can fight (according to the Rules). The player can change their choice at any time until the battle has not begun. During the raid, all the loot is placed in storage of the Battlefield. After the battle, the battlefield there are 18 hours and then automatically deleted. This page was last modified on 1 July 2015, at 17:45.